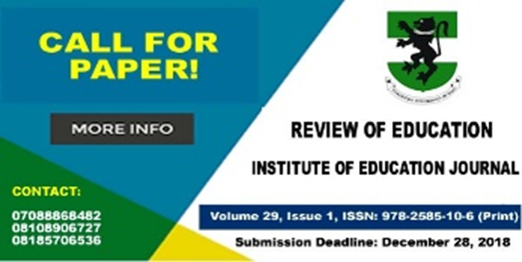 Review of Education is a high quality peer-review journal that is published by Institute of Education, University of Nigeria, Nsukka. The institute journal welcomes and acknowledges well high quality researched and scholarly articles on relevant, contemporary issues in all areas of education from researchers, academicians, professional and practitioner. Manuscripts, which are original and unpublished on research–based articles and other related areas of educations, are accepted on the clear understanding that no substantial part has been, or will be published elsewhere, and that they remain the copyright of the Review of Education. All articles must be original and include abstract of not more than 250 words. Immediately after the abstract, provide a maximum of 3-5 keywords. These keywords will be used for indexing purposes. Articles should not exceed 15 pages double-spaced on A4 paper, including references. Two hard copes and soft copy contained in a Flash Drive of the article is to be submitted. Articles should also be sent as an email attachment to ioejournal@unn.edu.ng only. The Editorial Board is not bound to return any article if rejected. Authors will download copies of the journal free of charge online at no cost, while the print version of the journal will be delivered to the corresponding author, including Free Soft-Copy Certificate of Publication. On receiving the author’s paper, the system will send an Acknowledgement Letter to the corresponding author immediately. The process of peer review may take up to 2 weeks. After reviewing the author’s paper, the editorial board will email a Notification of Acceptance to the corresponding author, indicating acceptance or rejected, as well as the date of publication. Authors are advice to edit their paper very well before submission. Once you submit the re-edited paper, the system will send you a confirmation email and means of payment. After publishing, the authors may download the e-journal from the webpage while hard copies are also available on demand. The publication fee must be paid within 5 days of receiving Notification of Acceptance email. For any delays in payment please inform the Managing Editor. The Institute accepts payments only by Bank Deposit. The Editorial Board deserves the right to reject any publication fee received that is less than the invoiced. Author must send the payment details such as Corresponding Author’s Name, Paper ID, Email, and Transaction Details to ioejournal@unn.edu.ng. In case of bank deposit, please email the scanned copy of Deposit Slip. Prof. Onyechi, Kay C. N.